MIAMI — Dwyane Wade arrived for work on Sunday not expecting to play much, if at all. His bruised right hip was sore and he was feeling pain with every step. 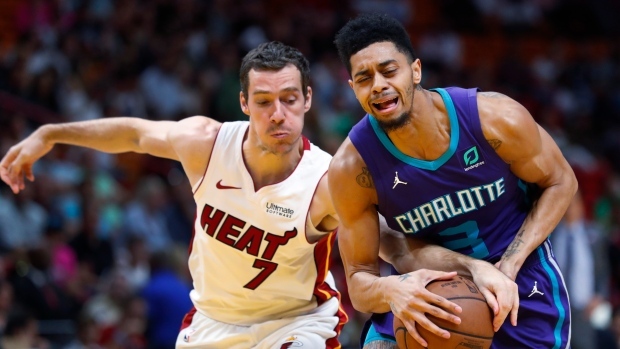 Goran Dragic scored 19 points off the bench, Wade added 17 and the Heat found just enough offence to beat the Charlotte Hornets 93-75 in a game with major Eastern Conference playoff implications. The win kept Miami (33-36) at the No. 8 spot in the East race — and moved the Heat two games up on No. 10 Charlotte (31-38), with 13 games left for both clubs. That was sort of an every-quarter issue for Charlotte, which shot a season-worst 31 per cent — along with 19 per cent from 3-point range. They were also the best numbers of the season for the Heat defence in both categories. It was 39-39 at the half, a 24-minute stretch that featured one clank after another. The Heat shot 33 per cent, the Hornets shot 35 per cent, and they combined to go 7 for 35 (20 per cent) from 3-point range. The difference was Miami heated up, shooting 47 per cent after halftime. Charlotte regressed to 28 per cent in the last two quarters.